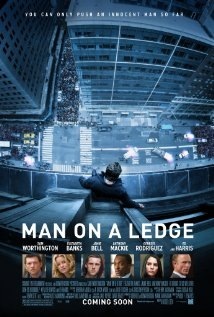 Man On A Ledge, starring Sam Worthington and Elizabeth Banks, follows a familiar Hollywood plotline. For a movie that is of a very familiar format, it needs to be innovative and truly great to make up for its lack of uniqueness. Unfortunately, it just doesn’t quite come through. Man On A Ledge is a dialogue-driven movie (my favourite) and is relatable to movies like Phone Booth or The Negotiator. Unfortunately, unlike some of my favourite dialogue driven movies (The Taking of Pelham 123, Assault on Precinct 13) Man On A Ledge fails to deliver in a number of ways. The acting is appalling (more on that later), the plot is unoriginal and predictable, and the characters had no draw whatsoever. As I just mentioned, the acting is pretty brutal. Elizabeth Banks falls flat throughout most of the movie. She never seems to nail down her character – I blame it on poor casting and her lack of depth as an actress. Sam Worthington’s performance is not overly impressive either. I spent the entire movie wishing an actor better suited for this type of movie would show up (cough, Denzel Washington, cough). The plot borrowed elements from a number of great heist movies and tried to meld them all together. Despite being a fan of heist movies and dialogue-driven movies in general, I was not impressed with the execution of Man On A Ledge. Some of the twists and reveals were well thought-out while the rest of the movie was predictable and unoriginal. The movie does pick up quickly though, and maintains a steady pace throughout. The characters were one of the worst parts of the movie. Elizabeth Banks character was intended to generate sympathy but I couldn’t help but hate her character for the longest time (although, it could just be the acting that I hated). Her altruistic ways did eventually have me come around to like her character. All of the other characters are forgettable except for a very attractive actress, Genesis Rodriguez, who was clearly there just to keep the audiences from wanting to leave the theatre (photo to the right from the movie). I would not be upset to see her in a number of movies going forward as “the hot girl” – she was the only one who was cast properly. All-in-all, the movie was not as terrible as I may have made it seem. It is merely a rental. Definitely skippable while in theatre. There is a lot to be entertained by here but there is also way too much that we can’t actually take seriously and it actually ends up being more of just a silly thriller that has a good cast, that doesn’t really do much. Good review. Man On A Ledge is a good movie, when the first time I watched it, I was impressed.